All children were included and given an instrument, children told a story and supported this in music, there was sufficient challenge but no child was made to feel like they weren’t doing as well. He went as far as to say everyone could be a musician especially using percussion instruments as we all have the ability to hit something which put our children at ease and meant one child particularly who is blind felt completely included. A brilliant workshop enjoyed by all, both children and staff. Excellent ... the booking process was easy and there was considerable support in arranging the workshops. The workshops themselves were superb - the students really enjoyed themselves and the activities were stimulating, matched the abilities of the students and stretched and challenged them. Years 1 and 2 completely enjoyed the workshop ... a very interesting experience for children and teachers alike. We would definitely recommend The Music Workshop Company. What we received, was what we got. A workshop tailored to our needs and inspiring to the children taking part. A smooth, efficient, friendly service. Thank you. The children had an excellent time and thoroughly enjoyed the day. Maria and Nia were brilliant. Thank you so much for a wonderful day. We will definitely be recommending the Music Workshop Company to other local scout groups as well as to the district commissioner. The experience was seamless from the start and the workshop itself was brilliant. The Music Workshop Company immediately understood our problems at our initial enquiry ... booking the workshop was simple and everything ran like clockwork. The workshop identified and dealt with the main problems which are faced by the two orchestras that participated. The pace and style of presentation were very appropriate and they were delivered in a capable and confident manner which held everyone’s attention throughout. This is definitely the most valuable activity that our orchestra has done since its formation. The children thoroughly enjoyed the experience and it gave them the opportunity to work together to create a musical sound they had never experienced in school. All the teachers were really impressed with the workshop leader's teaching style – not speaking and controlling the children with just the use of gestures .... easy to work with – which is a real breath of fresh air! Thank you so much, we were delighted with our Rhythms from Around the World workshop .... It was a great way to break the ice and begin this exciting new chapter at Grace's Space. I'm sure you'll be hearing from us again in the future. Through the launch we were able to start building a rapport with the children and we got some very good feedback from parents, helping us to plan and structure future sessions. The workshop leader was brilliant and so enthusiastic! We had a great afternoon. 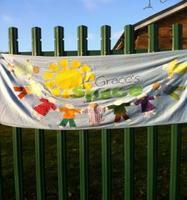 The leader really worked our Gifted & Talented pupils and they enjoyed every minute of it; they were really stretched. We would definitely recommend The Music Workshop Company to others. In July 2010, we returned to Churchers College to run a mix of Samba and African Drumming workshops. These workshops are a regular fixture in the Churchers College Calendar and this was our third visit working with the students. "Excellent service – our year 9 pupils were enthused and motivated by the experience." Brilliant. It was great to offer the children something that they had not done before and we will definitely be booking again. Maria clearly knows her stuff! Well, we have reached the end of our music week and it has been absolutely wonderful. I wondered if you could let all the musicians know, again, how fantastic they all were. The children and staff have thoroughly enjoyed the whole week. We have enjoyed each and every workshop and it was lovely that the children got the opportunity to compose their own songs to. We thought everyday matched the expectation of that region well. Very enjoyable, professional. [Liked the] Positivity of the musician. The tasks for the children. [We liked] how Donal adapted the workshop according to abilities and needs of the children. [The experience was] really positive. The facilitator was very experienced in managing the groups, involving everyone and adapting to the situation and specific client’s needs; time management; structure of the session. Matthew was excellent. 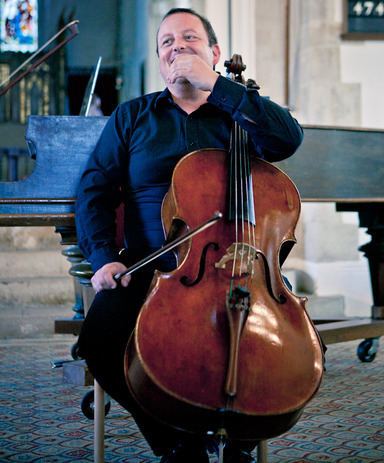 I really enjoyed the ‘share’ assembly at the end of the day with the song “Zoom Galli Galli” and on the second day the children loved hearing the cello. Easy to Book. Good practitioner. Not too expensive. I was really pleased with the way the workshop leader got the children working as a group/ensemble from the start. Even as a whole year group, it made them focus on working together for the rest of the day. The material and songs chosen to demonstrate the points he was making was relevant to the children, and he made sure everyone was included and involved at every stage of the day ... would most definitely recommend The Music Workshop Company to colleagues. The outcome was excellent, the performances by the students at our international evening were well received and were enjoyed by both the students and the audience. We have had a lot of positive feedback. The whole experience was excellent. The pupils were so engaged and enjoyed the experience. The whole project was planned and delivered well. We were using the workshop to encourage more uptake in our exam classes – the workshop leaders were SO enthusiastic the students really enjoyed the 3 hours. An excellent and professional service. The students (and teachers) really enjoyed the workshop. The children enjoyed using the ‘foreign’ instruments and exploring how they could make music with them. They were allowed to go about it in their own way, as the session was less structured than it would have been in a formal education setting which matched the environment we were in. 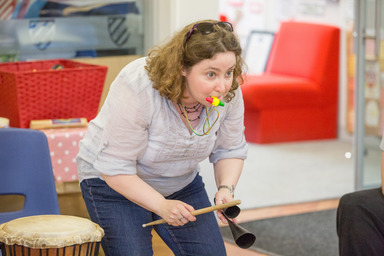 The music leader was very knowledgeable and very patient with the kids … enjoyable, satisfying and informative. Overall it was excellent. The workshop leader was a great facilitator and got everyone engaged in the activity … was very flexible … when the time available had to be compressed… it was a pleasure working with the Music Workshop Company.